Chalk Talk: A Kindergarten Blog: A Zoo-pendous Time! Every spring we take a field trip to the Fort Worth zoo. A few weeks before we go, we learn about different zoo animals. We learn about their needs, about living and non-living, and about an animal's dependency on the earth and their environment. 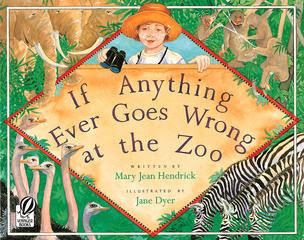 We read the book If Anything Ever Goes Wrong at the Zoo by Mary Jean Hendrick. Then we write about what we would do if anything went wrong at the zoo. We brainstormed ideas for what different zoo animals would say if they could talk. We learned about using quotation marks in our writing.